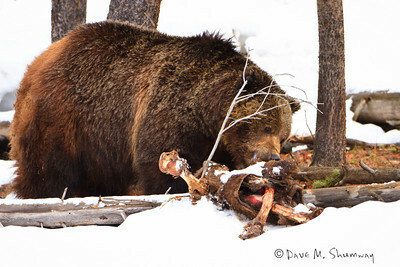 A boar grizzly bear eats at a winter kill carcass near Old Faithful on a cloudy April morning. With staggering amounts of winter snow fall there were over five winter kills within 50 yards of that carcass. Shot with a Canon 7D with a 500/4.0L IS set in manual mode set at f/5.0, 1/500th of a second, and ISO400. Shot from a Gitzo 3540XLS with an Induro GHB2 gimbal head and custom long lens support. Typically I do not expect to come home with great images from my April trip to Yellowstone, I often choose to focus on calving bison; but with all of the snow they are doing all they can to delay the inevitable. The benefactors from all of the snow are the wolves, bears, and coyotes; with all of the snow they are still having a hay day. Saturday I spent a few hours with a grizzly bear, named "Bison Killer," near Old Faithful as I enjoyed my first 2011 trip to the park's interior. Then on Sunday I had the privilege of seeing the Lamar Canyon, Agate, and Canyon wolf packs all before 9:10am, and then I got to watch the alpha male of the Canyon Pack chase down a small group of elk, and make a kill behind some trees, around the same time the pack's alpha female made another kill a few hundred yards above, it became time to feast for the pack. Many of you know that the alpha female of the pack is a beautiful "white" wolf, and she is very pregnant right now. The distance proved too great to shoot images without seeing the ill effect of atmospheric distortion; but I was able to pull one image of her out. Today I spent the morning trying to hunt down some wolves; but I ended up only shooting Killdeer. It was snowing hard this morning; but it let off around sunrise, as I drove home I was greeted by heavy snow, and now the snow is piling up in Billings 2'-4' by tomorrow morning. The weather was cloudy with a some snow and/or rain falling throughout much of each day. High temperatures are getting near 50° and lows are still falling below freezing at night (around 28° or so). I camped both nights, and thought that it was lovely. Happy shooting, and remember May is just around the corner.